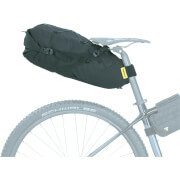 Perfect for occasional use when a traditional saddlebag isn't big enough. 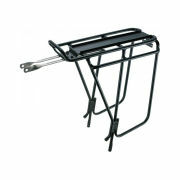 Supported by a light weight exo-frame with quick release fitting to a seatpost mounting bracket. 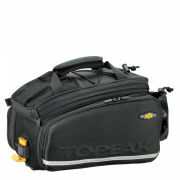 Divided main compartment, with 3 individual storage spaces and one zip pocket. Fits 25.4 to 34.9mm seatposts. Maximum weight capacity - 4.5 kgs. Rear light clip and rain cover. Extra water repellency and resistance to staining. 600 Denier and EVA foam. Please note: The image does not show the mounting bracket. The claimed 430 gram weight is pretty accurate, but does not include the weight of the mount bracket of 75 grams and the weight of the plastic rain cover. All combined, the actual weight is 519 grams (1.14 pounds). It would have been nice if the casing of the mount bracket did not occupy at least 3 inches of the seat post. Therefore if lowering the seat post is important, install the mount bracket as high as possible near the seat, keeping in mind that the seat will now interfere with the hood of the bag as it opens like the trunk (British boot) of a car. 3 different shaped mount brackets are included to fit on various size seat posts - the largest being egg-shaped of 1.75 inches long by 1.25 inches wide.